If there’s one thing about space that anyone is likely to know, it is that Mars is red. Redness, in fact, is the defining quality of the fourth planet from the sun. Glimpsed from afar, through the telescopes of the 19th century or the Hubble Space Telescope, Mars looks red. The top line of images show the raw images direct from the Rover, without any processing. The bottom line of images have had their saturating increased, so that the subtle color variations are more noticeable. In either case, what’s immediately clear is that Mars is not just a red planet. Mars is not really red at all in many spots. At the most extreme end, you might call it ruddy. 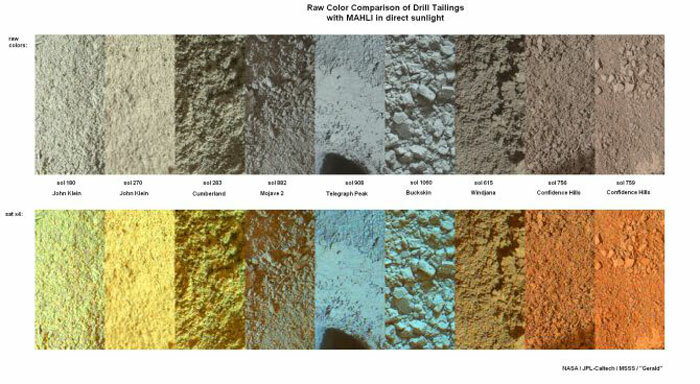 The color differences are explained by the varying chemical composition of the rocks that compose the Martian surface. They also show just how much we have to learn about what lies beneath the surface of Mars. It’s not just about finding water or life, but about understanding the fundamental properties of this planet that humans have been wondering about for hundreds of years. Humans, and even superhumans like Elon Musk, are still years away from visiting the planet, but there’s something wonderful about our little rover doing mundane scientific work on the surface of another planet, drilling away, showing us what lies under the red cover.